Located halfway between the major arterial roads 7th Street and 7th Avenue, Central Avenue is the dividing line for Phoenix’s east and west sides, while its intersection with Camelback Road has traditionally been a gateway to the heart of downtown Phoenix - an area rich with businesses, schools, arts institutions and residential districts. But, instead of traveling south - into the beautiful downtown area - try taking a drive north. A coveted Central Avenue address between Missouri and Northern usually comes equipped with a large front yard, flood irrigation and an estate-sized home. Private pools and large guesthouses are also a common find. These large old homes are also included in the North Central neighborhood, but bear special mention because of their Central Avenue address. This is an area void of curbs, where Mesquite and Palo Verde line the road and where horses can still be seen trotting beneath the dappled shade on Murphy Bridle Path (below). The air seems cooler, too – since most (if not all) of these homes have grassy front lawns and large trees on the property. Central Avenue in Phoenix Arizona is a special address indeed. AJ’s in the spot to shop for groceries if you live along this strip and Postinos always has a mouthwatering board of Bruscetta and a great glass of wine waiting for you! Murphy Bridle Path: You'll seldom spot an urban cowpoke moseying along the Murphy Bridle Path, which runs along the east side of Central Avenue from Bethany Home Road up to the Arizona Canal. But the 2.5-mile-long crushed-granite path is a popular place for joggers, dog walkers and folks with baby strollers. The trail was named for William John Murphy, who was hired to build the Arizona Canal in 1883. 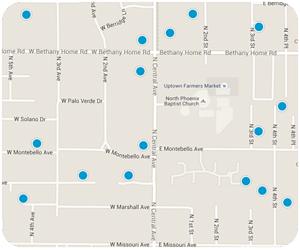 Welcome to historicphoenix.com, your #1 internet resource for buying and selling in the Central Avenue Corridor. On this site, you will be able to find nearby school information, restaurants and grocery stores, buyer resources, seller resources, and search all Central Avenue Corridor homes for sale. Our goal is to provide you with the most valuable information and service regarding Central Avenue Corridor real estate and homes for sale. Through this site, we provide you with access to MLS listings and resources for buying and selling a home, but most of all, an easy way to access expert guidance as your time to buy or sell Central Avenue Corridor real estate approaches. In today's real estate market, it takes more effort, time, and resources to sell your Central Avenue home. We are personally committed and passionate not only about selling your home, but selling it for maximum market value. We offer our clients a full line of services and a network of service providers to not only provide you with maximum market exposure through our extensive and aggressive marketing plan, but to provide a tailor-made solution to handle all aspects of your real estate transaction including pre-listing preparation to best showcase your home. We also work with an extended list of service providers who can help meet all your needs related to the sale of your Central Avenue Corridor home. Find out what your Central Avenue Corridor home is worth TODAY. For most people, purchasing a home is the single largest and most exciting financial decision they can make. That is why we take finding a home for our clients very seriously. We're not only committed to finding you a home, but to finding you the absolute best home on the market at the best possible price, and if one does not exist on the market, we'll search off-market properties and do our very best to find you the right Central Avenue Corridor home. This website also serves as a tool for clients to search properties currently on the market, receive up to the minute market updates through email, and even request showings. Start searching now OR let us do it for you!